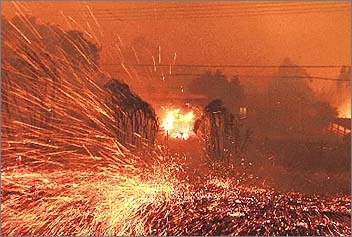 On this day in 2003 many suburbs of the City of Canberra were engulfed in flames, as the picture above shows, the embers from the firestorm caused the most devestation, as winds reaching 100 km/h swept through our nations Capital fanning flames in the smoltering heat with temperatures that day reaching 40+ degrees celsius. 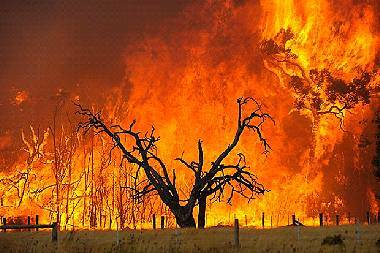 The embers would sweep ahead of the firestorm front (carried by high winds), lighting up anything that could burn, before the firestorm engulfed anything in its path. 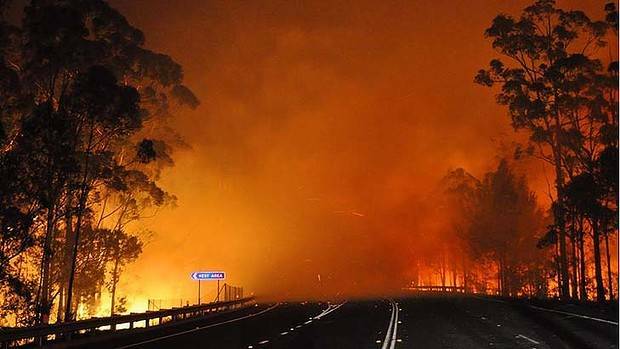 Footage of the firestorm saw firefighters travelling through the suburbs of Canberra with the flames travelling through the treetops faster than they could drive. 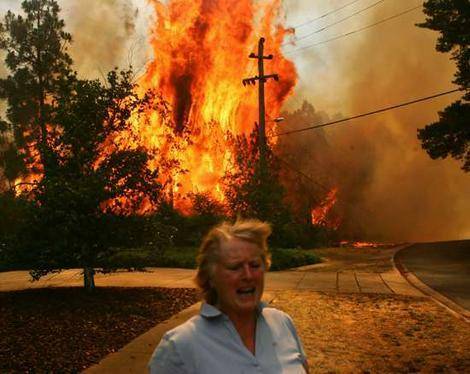 News footage showed firefighters weeping, as they stood helplessly and watched while they could do nothing to save the 450 homes and hundreds of businesses as the flames swept through the Australian Capital. 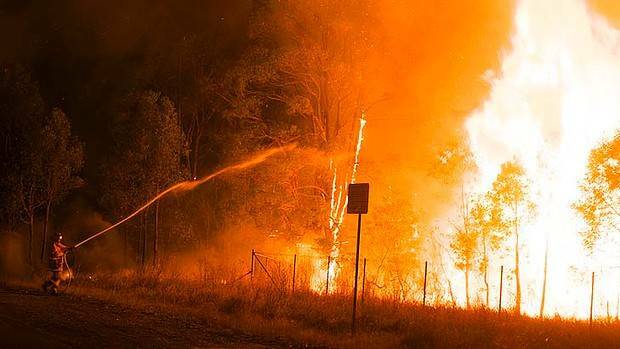 It took litterally a few minutes to destroy 3 Canberra Suburbs the best they could do was evacuate the effected areas before the fire front arrived. They rescued terrified residents running for their lives as they passed other fire engines that had been engulfed by the flames. 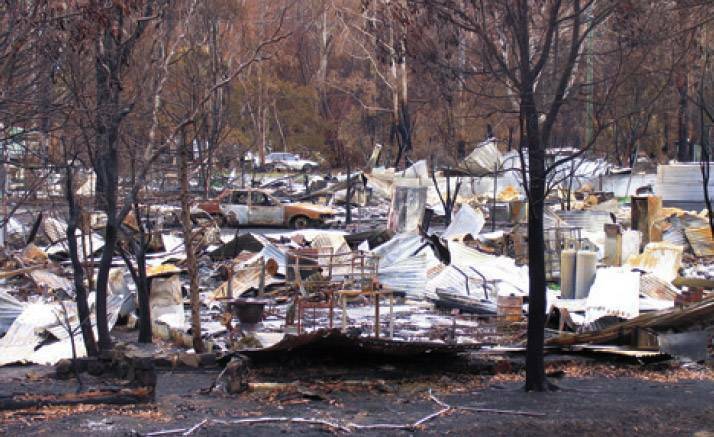 Today I would like to pay tribute to the hundreds of fellow displaced Canberrans, and the 4 people that perished on that terrible day. 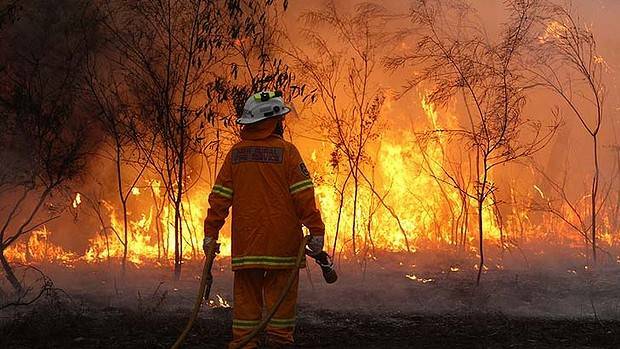 I would also like to give thanks to the Firefighters from the A.C.T., NSW & Victoria who gave assistance to save us and the thousands of other homes in the district....today we say thanks guys, we will never forget you.